A good cup of meat broth was once the conventional medicine that was advised for colds and recovery from sickness in general. 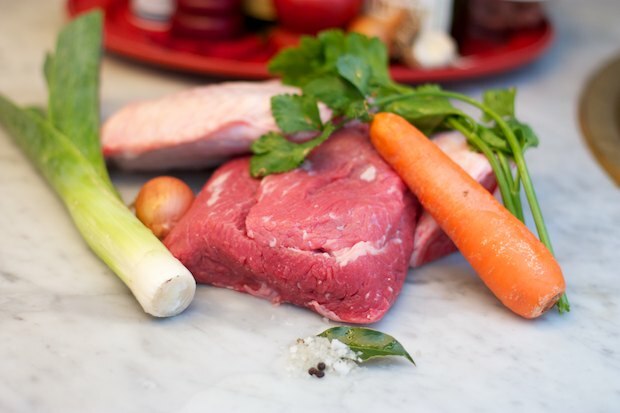 Today meat broth is made with various types of meat and granulated preparations, making it possible to prepare soups without having to follow the lengthy preparation for broth. 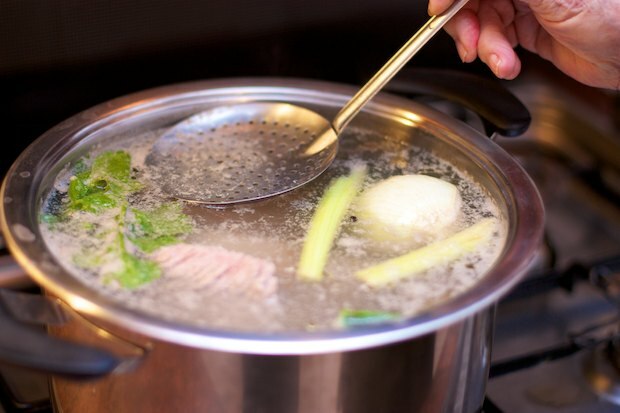 In more recent times, meat broth has been demonized by both macrobiotic cuisine and vegetarian diets, defining it as a factor that intoxicates the body. I do not know who is really right. In any case, I think that during the cold season, preparing a beef broth for a light dinner or opening up of the dinner itself certainly is good for the soul. Stock requires a long cooking time, so it doesn’t fit with the philosophy of quick dinners. I suggest you prepare a large quantity on Saturday so that you can freeze it in containers an use it according to your needs. Then when you feel like a soup, it can prepared quickly. Broth can be prepared with various types of meat and in the tradition of every country there are different versions. The recipe that I propose is a classic of Italian cuisine, a recipe that my family has been using for generations. Meats were once kept at home, but now I use a local co-op farm called “Azienda Andreana” who raises animals in a natural way. If you freeze the broth, then you are left with boiled meat that not too many people enjoy. In the recipes of the week I decided to include “Grandma’s Meatballs” that represent the classic way to reuse boiled meat and meat scraps. For a good broth it is necessary to add all the ingredients in the pot together. This way the meat releases its juices and broth acquires flavor. If you are interested in the meat retains its softness and its juices, add the meat when the water boils, due to the heat, the meat doesn’t break down. Thoroughly wash the ingredients then add them to a high-sided pot. Add the water and bring to a boil. After about 30 minutes, the broth will form a gray foam. Carefully skim off the scum with a ladle. This will produce a clear broth. Repeat the operation several times. Lower the heat and continue cooking for about three hours at a low boil. Turn off the heat and cool the broth. Pass it through a mesh strainer that can hold the very fine parts of the fat that rises. Posted in Soups. RSS 2.0 feed.